Two Cell Signaling Technology antibody clones, ALK (D5F3®) and ROS1 (D4D6®), were featured in an article authored by the Tumor Biomarker Experts of the Chinese Society of Clinical Oncology. The article, Guidelines for diagnosis and treatment of ALK and ROS1 positive non-small cell lung cancer in China, was published in the April 8th, 2018 edition of the Chinese Journal of Pathology, and included ALK (D5F3®) and ROS1 (D4D6®) in its recommendations for use in conventional immunohistochemical (IHC) testing. Cell Signaling Technology (CST), a leading provider of antibodies, kits, and services announced that two of its antibody clones, ALK (D5F3®) and ROS1 (D4D6®), were featured in an article authored by the Tumor Biomarker Experts of the Chinese Society of Clinical Oncology. The article, Guidelines for diagnosis and treatment of ALK and ROS1 positive non-small cell lung cancer in China, was published in the April 8th, 2018 edition of the Chinese Journal of Pathology, and included ALK (D5F3®) and ROS1 (D4D6®) in its recommendations for use in conventional immunohistochemical (IHC) testing. According to data from Cancer Statistics in China (2015) published by National Cancer Center, the most commonly diagnosed malignancy among patients in China was lung cancer (733,000 new cases), 80% of whom were diagnosed as having non-small lung cancer. ALK and ROS act as oncogenic fusion partners to an array of proteins and have been identified as tumor drivers in non-small cell lung carcinomas. 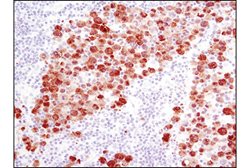 The ALK (D5F3®) and ROS1 (D4D6®) antibody clones recognize both the normal protein and the oncogenic fusion proteins and are therefore important tools for preliminarily identifying patients that may benefit from treatment with first-line or second-line drugs that specifically inhibit the activity of the fusion proteins.